American Dippers Like It Wet Jersey Scarf: Super comfortable and super-soft, this everyday T-shirt scarf is the accessory that keeps on giving. Made with pre-shrunk 100% jersey cotton, it's great for winter warmth and summer style! One size fits all (90" x 16"). Available in black, navy, heather grey and white. Check out other products with this design or view all . 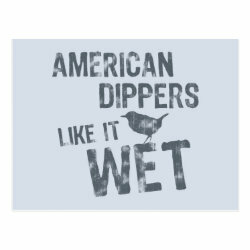 This scarf with our American Dippers Like It Wet design is made-to-order by Zazzle.com. Zazzle offers 100% money back guarantee on our high quality Cute Union products. In case you are not happy with your purchase, you can always return your scarf for an exchange or refund within 30 days of receipt. See customer service for more information.